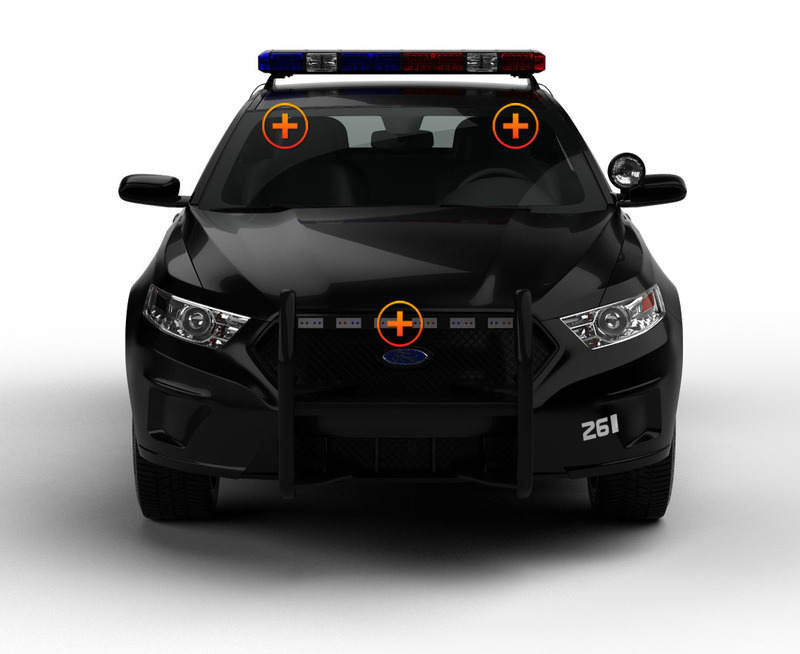 This Lynx model 19.5” interior light bar with 30 flash patterns is perfect for dash or deck mounting in smaller police cars and emergency vehicles, and it can even be mounted on the exterior because it’s sealed and waterproof. The Linear 1 Optics project the strobe pattern of your choice far and wide and is seen for over 2 miles day or night in most weather conditions. The aluminum housing has 4 modules; each contain 6 Generation IV 3-Watt LEDs for a total of 72 Watts of pulsating clear light. 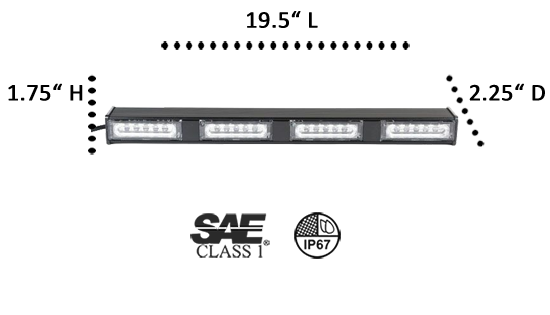 Customize your light bar by selecting a solid color or split-color combination from 12 choices. It’s quick and easy to install the light bar: just connect the mounting bracket to the light bar, attach the suction cups, position the light bar, and plug in the combination power control with ON/OFF and Flash Pattern switches, and you are Ready...Set….Go! You can quickly relocate the light bar whatever you’re driving, or you can permanently hardwire it into a light or siren system already in place. The engineering team at Extreme Tactical Dynamics always has the safety of our customers in mind when designing products. Delivering powerful, trustworthy lights that are highly visible keeps you safe and ‘seen’ even in the worst weather conditions on the darkest nights. Then offering our superior lights at low, economical prices is the WIN-WIN combination that is paramount in our marketing strategy. All of our products meet our stringent design and manufacturing guidelines; the Lynx Series with TIR or LIN lenses is no exception. This light seems to be best for external mounting. While it's super bright, packed with different flasher patterns and easy to connect to the cigarette lighter plug, it only came with two mounting options: window suction cups and exterior brackets. There was no visor hardware included, and since that was the whole reason I bought it, I had to purchase my own headliner attachments separately. This wasn't really the product's fault, but I would have liked to see the extra brackets included for the price. While you could settle for using the suction cups, I wouldn't recommend doing so if you're the type of person who likes to make lots of sharp turns and hard stops. On the other hand, it comes in lots of different color options with a few dozen flash patterns to pick from, which I honestly can't complain about. This light is compact and versatile. Instead of having to waste time requisitioning a bunch of different light bars, I was able to get illumination for the exteriors and interiors of our department vehicles without much confusion. These lights have really solid aluminum shells that are appropriate for EMT and LEO use. The brackets also feel extremely secure, which is a must in urban environments. So far, we haven't had any complaints about the brightness of these lights. We also love the fact that they're compliant with SAE and Title 13 regs. When you want a straightforward, waterproof vehicle lighting solution, it's hard to go wrong with this one. 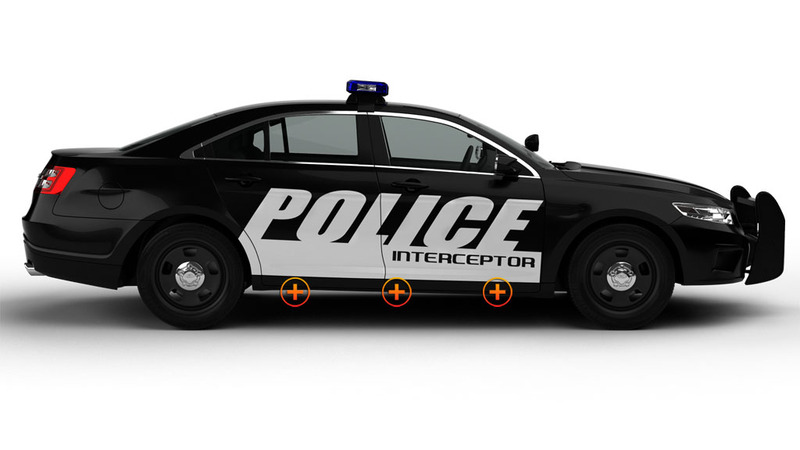 I wanted new light bars for the sides of my Ford Interceptor. After doing some research, this seemed like a good option, and it was pretty affordable. When the lights got here, I wasn't too sure about whether they'd work. I can be a fairly aggressive driver, to say the least, and I didn't know whether they'd keep up with me. I've already lost a couple of light bars to minor scrapes in my time, so I was ready for these to fail as well. Much to my surprise, these light bars not only stayed where I mounted them but were also extremely bright. I placed them low to the ground by the rear doors and so far so good. I'm absolutely in love with this light. On top of having dozens of patterns, it also has a memory function so that I don't have to cycle through all of them to find my favorite. My order also came with a handy shield to keep the glare out of my eyes when I use it on the dashboard. The engineer who designed this light should get an award. I got a second one in the hopes that it would fit my PIT bumper, and it went on with no problems. It also stays still while I drive around, which is way better than my previous light bar. Overall, this is a very convenient piece of hardware. If I had one complaint, I guess it'd be that I would have liked a heftier power cord and plug just in case, but the waterproofing seems good enough to keep me out of serious trouble. This light bar seems up to rough handling, and it's really bright. What more could you ask for? I bought this to replace an old work light that I used to keep on the roof of my F-series truck, and I'm happy to say it was a perfect match. The brackets made mounting a snap, and I kept the suction cups in case I want to put it in one of the windows. As a construction site work light, this was a smart choice. While it would have been neat to get a light that spread out further to brighten up a wider area, the same model comes in a few options with different numbers of LEDs. It's also nice how solid the outer case feels – I don't think I'll break this one anytime soon. This light bar was pretty convenient, but it could use a few improvements. Even though it comes packaged in a waterproof case with shatter-resistant lenses, the cable is only 9 feet long, so it might not be suitable for some vehicles and mounting positions. For instance, you might have trouble using it as a tailgate utility light if your truck's bed is full of junk like mine always is. This light plugs right into the cigarette lighter, which is handy, and it includes a few different brackets and suction cups for mounting. I think I would have been happier if I had picked up one of the bigger models with more LEDs, but this will probably work for most people. This is a great light for your dashboard, but it also works outside the car. 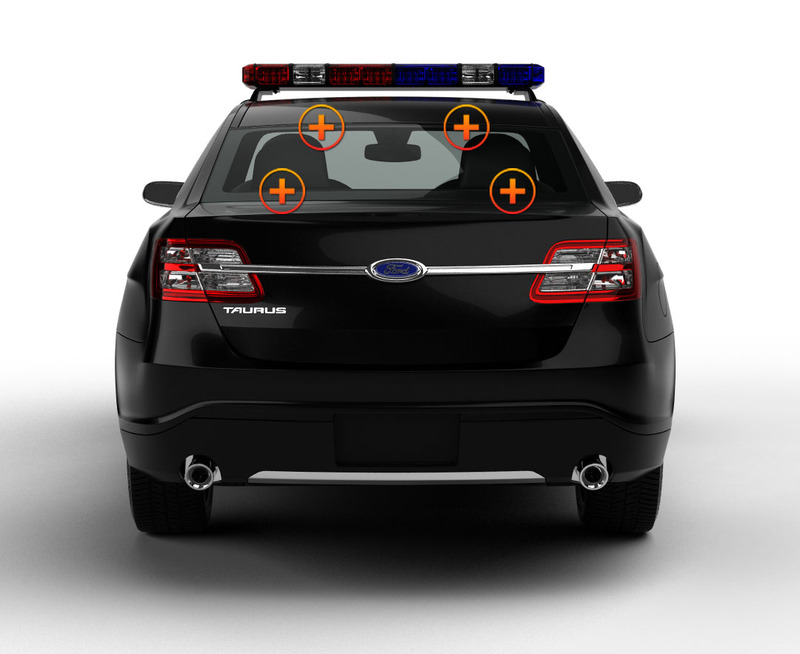 You can attach it to the exterior of an emergency vehicle without worrying about it shorting out since it's waterproof. Another neat aspect is that it includes 30 different flash patterns – Although I probably won't need that many, it's nice to know I have the option. I like that this light bar is made of aluminum with polycarbonate lenses. I plan to put it through its paces, but so far, it seems pretty sturdy. At just under 20 inches, it's a good fit for the inside or outside of my car.